It has been a great vehicle, but the time has come to take it off the road. This is a common situation that we will all face one day. Take heart that while it will no longer be getting you where you need to go, it can continue to help others by donating it’s used parts to keep other vehicles running. Here are a couple of tips that will help you go through the process of properly disposing your vehicle. First, make sure that you have all of your personal items out of the vehicle. Don’t subject yourself to identify theft by leaving important documents behind. Locate your local auto recycling facilities. Look for those who are environmentally friendly and are well established. Call around, most yards can give you a price over the phone as long as you can provide accurate information about the vehicle. You can arrange delivery or many auto recyclers can tow your vehicle for you. Prices may vary based on year, make and model along with scrap price. Finally, make sure you have proper documentation. If you have lost your title, it may not be an issue. Check your state laws to understand your options. 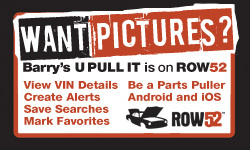 If you have a vehicle to junk, call Barry’s U Pull It Auto Parts in Alabama at 251-653-2925 or Mississippi at 228-255-8500. Our friendly staff will be happy to assist you.